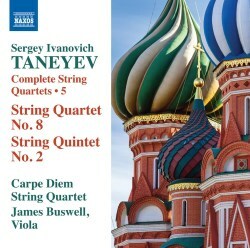 For the final volume in their five-disc Taneyev String Quartet series, the Carpe Diem Quartet have stuck firmly to C major with the eighth Quartet, (dated 1883) and the second Quintet (of 1905). In this latter they are joined by a second violist, James Buswell. C major was clearly a key Taneyev felt exuded good cheer and contentment; not for him the “red/warlike” connotations it had for Scriabin and Charpentier, or the “white/pure” ones perceived by Rimsky-Korsakov and Schilling. From the point of view of tonal associations, Taneyev seems to have been more attuned to the ideas expounded by Hermann von Helmholtz in his Die Lehre von den Tonempfindungen als physiologische Grundlage für die Theorie der Musik of 1863. He stated that the qualities of C major were, among other things, “certain, decisive powerful resolve, manly earnestness and deep religious feeling”. There is a bit of all of that in this music. But before I discuss the performances, it might be worth pointing out that the numbering of the quartets is highly contentious, and does not in any way reflect their chronological sequence. If we accept that Taneyev wrote nine quartets (that is the number the booklet note suggests) then the work which appears here as the “eighth” Quartet was actually the second to be completed, so it is a relatively youthful work. At the age of 26 Taneyev was teaching piano at the Moscow Conservatory and had only entered the public arena as a composer two years previously. So the music certainly shows a reliance on the examples of the great Classical masters and an unwillingness to step out too dramatically from the realms of what was considered traditional in this most traditional of musical genres. But that is not to deny that within those limitations, the work has much to attract the listener. It is notable for its wealth of good tunes and unfussy harmonies. Certainly the Carpe Diem Quartet convey the mood of youthful vigour and open-hearted virility in their performance of the Eighth Quartet. They do not not shy away from Taneyev’s decisive gestures and “manly earnestness”, something which occasionally becomes a byword for a certain limited imaginative scope. The music is spirited and uncomplicated, and in this performance fresh and very enjoyable. With the Quintet, we are in a totally different world. Here the richness of the texture and thickening of the sound is the result of far more than just an extra viola added to the mix. At times this veers into the almost mystical religious fervour of Scriabin and certainly the emotional content has much in common with Tchaikovsky. There are a lot of imaginative and original effects, notably the ostinato figure shivering its way through the lower strings between 3:20 and 4:08 of the 1st movement. There also are moments of almost passionate intensity—perhaps the “red” C major of Scriabin is not totally alien to Taneyev’s feelings for the key. As with the previous issues in the series, the performances are beyond reproach in their technical command of the scores, and they bring very much to life an area of the chamber music repertory which has been largely overlooked. The recorded sound is clean and full-bodied There is much here to entice those who enjoy their chamber music with a gently romantic tinge.